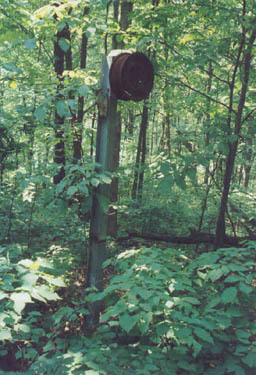 Will Bloombergh discovered a single rope tow tower on Observatory/Silver Hill in Haverhill during the summer of 2004. We originally had no record of this ski area anywhere in any publication. Turns out, the area was a private family ski area. Joan Sapienti Andrews father built this ski area for their family and friends: My father put together that ski tow on Silver Hill in Haverhill. It was a private ski area in our back yard on Warrenton Road. The only people that used it were family and friends. It was approximately 1000 feet long with a single rope tow powered by an old car. We used this in the early 60's and 70's. The vertical is approximately 100 feet, as you can see in this topo map. 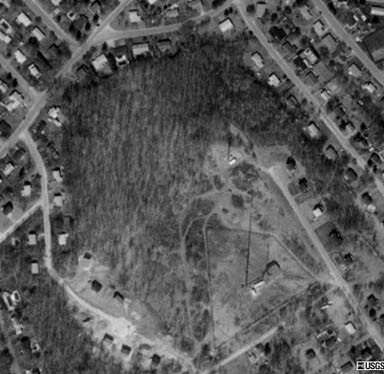 An aerial shot shows few homes on the hill, but some trails and communications towers. It is unknown where the ski area was on this hill, but based on the photos below, was likely in the woods on the northern or western side of the hill. 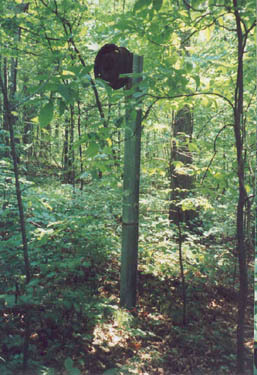 A lone rope tow tower still stands, painted a pale green, now deep in the woods. A different view of the same tower. 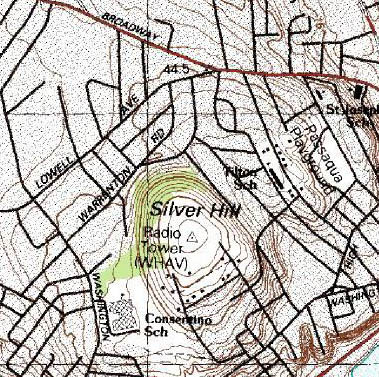 Matt Belfiore has some more info: I'm writing in regards to the ski tow discovered on silver hill in Haverhill. I grew up in the area in the 70's and 80's. As long as I can remember there was never a ski tow there. I used to play in the woods where the picture was taken all the time. When I was a kid there was a whole line of tow towers stretching from the bottom of the hill behind the houses, to the top. I have always wondered who constructed it and when it was in use. If I had to guess, I would say that it was probably a private tow, set up in someone's backyard. It seems to be the only thing that would make sense, knowing the area. Judging by the size of most of the trees that had grown up around the tow towers back in the 70's and 80's, I'd say that at that time, the area couldn't have been used for at the very least, 30 years. Still, it's always been a weird, little mystery. If you have more information on this area, we'd love to hear it! Email it to nelsap@yahoo.com.